Jürgen Klopp’s half-time message at Turf Moor was the catalyst for Liverpool’s hard-fought 3-1 win over Burnley, according to Xherdan Shaqiri. After a goalless first 45 minutes, a much-changed Reds side fell behind early in the second period. The visitors upped the ante following Jack Cork’s opener, though, and responded rapidly through goals by James Milner and substitute Roberto Firmino. 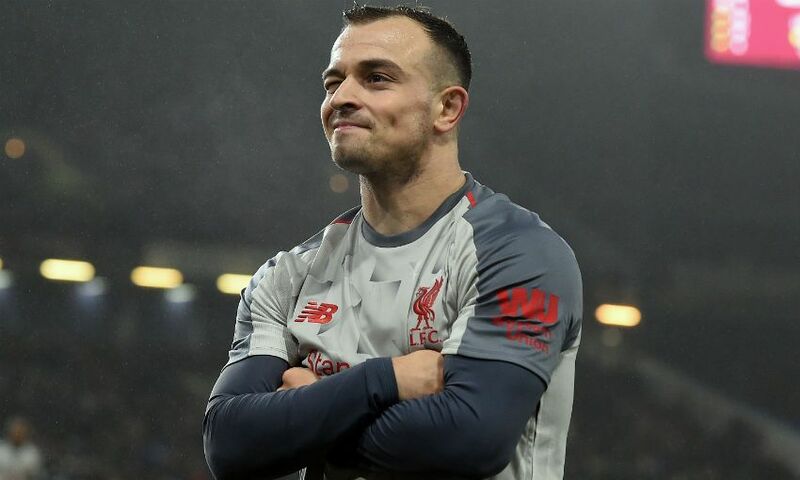 Shaqiri, one of only four players to retain their starting berth from Sunday’s Merseyside derby, then applied the finishing touch in stoppage time when he rounded off a lightning-quick counter-attack with aplomb. Victory keeps Liverpool, who remain unbeaten in the Premier League this season after 15 matches, within two points of table-topping Manchester City. And the No.23 believes the manager was the architect of their second-half improvement versus the Clarets. “It is always tough to play here. I played with Stoke here and it was also a cold, rainy day. It is not simple to play this game but we managed it very well and we fully deserved to win,” Shaqiri said. “First half, maybe not so good, but the second half we played like we usually play so we got a lot of chances. Shaqiri also feels the fact Klopp is able to win while rotating his XI proves the strength of the squad he has at his disposal this season. The Switzerland international continued: “Definitely, it shows the depth. It gave a lot of players confidence to play this game.